Coffee Cake--this was a cake donut with cinnamon swirl through the donut topped with streusel crumble and glaze. It definitely had the flavor going for it. The cake was dense and crumbly in a good way. It was still warm and moist, a plus for any donut. Might be a little on the sweet side for most folks but would go well with a strong dark roast cup of joe. Chocolate Coffee Crunch---this was a basic yeast donut, risen lighter and supposedly fluffier thank traditional cake, covered with a chocolate glaze and crushed coffee beans. As for the donut part, I found it a little doughy and gummy, meaning more than likely, this batch was taken out of the oven too soon or the crust browned too quickly not allowing the dough to reach its full volume. Plus the coffee taste was way too bitter for me. Granted, I'm not a coffee drinker but this was really harsh mixed with a dark chocolate. All around, just not my favorite. Strawberry--this was the basic cake donut covered with a strawberry glaze. They seem to have gotten the cake style down and this one was also good. The glaze has a great strong burst of strawberry. Kids would love it. Honey Butter--a cake donut mixed with some cornmeal covered in a honey butter glaze. I think the goal here was to be some sort of hush puppy/donut hybrid and for me they succeeded swimmingly. It was by far my favorite of the bunch. The texture was spot on with hints of corn flavor and the outside had a nice crunch. The glaze was not too sweet and spot on. I could have eaten a whole dozen of these by myself. Plain Glazed--another of that batch of yeast donuts covered in a standard sugar glaze. This one suffered the same as other and the dough was too gummy. It made the cake ones seem light and airy. I feel like it could have been a glaze above the standard but that dough just let me down. Blueberry Bourbon Basil--the yeast donut again, though these seem to be from a different batch. It was a little better. The glaze on top was the blueberry bourbon basil mix and up close you smell the bourbon coming off the donut. Once you bit into however, the flavors will a little muddled. Could barely taste the bourbon and the basil I just didn't get at all. The blueberry also seemed to have erred on the subtle side. An overall interesting combo idea that just didn't come together for me. No, I didn't eat the whole one of all of these, I took a few bites of each to get as much taste and texture sense out of them I could. Though I did scarf down that Honey Butter--yummy! I'd say they really have the whole cake donut thing down and for that alone they are totally worth a visit. Plus, did I tell you how much I loved the Honey Butter! If not, it just bared repeating. 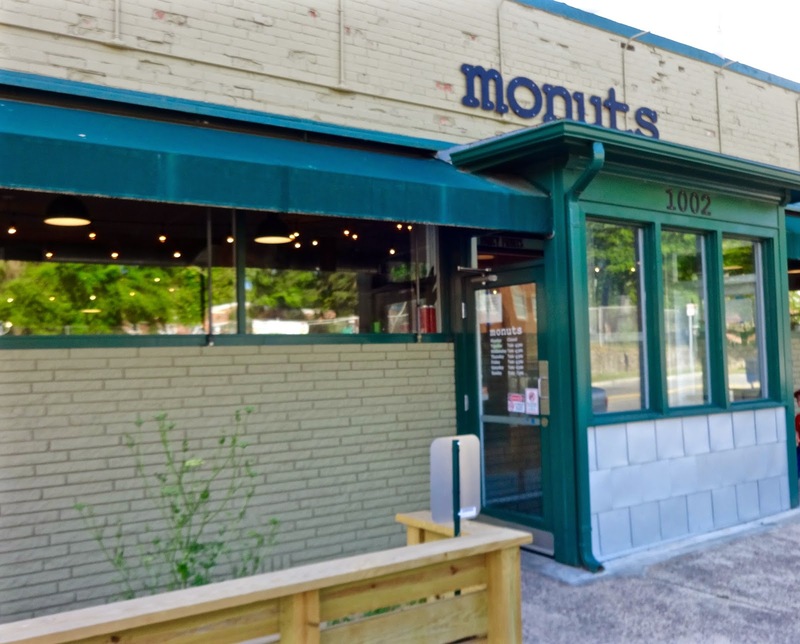 As a fun and funky place to get a treat in Durham, Monuts is definitely worth a visit. 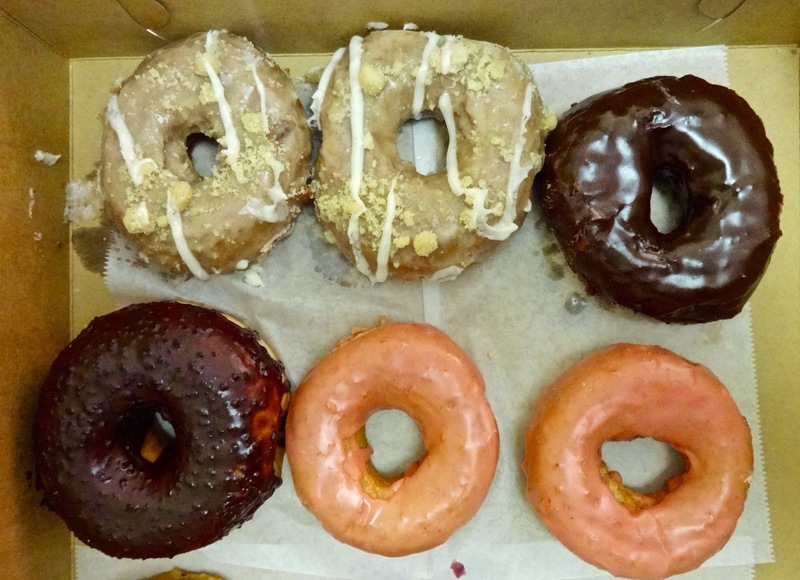 The cake version donuts are worth a try if one of their flavors grabs your eye. The yeast could also be good, though seems you may take your chance if you get one. Either way, I'd still go back, you know, for that honey butter. No need to get up, we'll bring donuts to you. 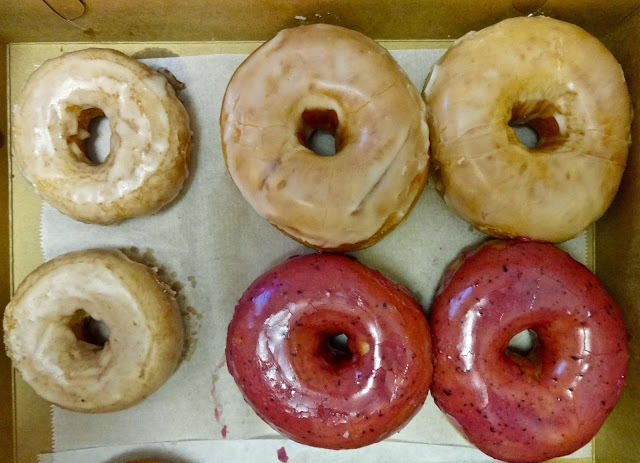 Find the location closest to you and either click to order on Donuts Delivered, or call us, and we'll take your order.